Hey, everyone! Welcome back to this week’s edition of Emotions With Animals! I have recently wrote Enchanted Egyptian Beauty, Jealous Crayons, Emotions With Animals:: Jealous Parrots, Angry Candy Story, Emotions With Animals: Angry Ducks, A Sad Princess Story, Emotions With Animals: Sad Cats, A Happy Fairy, Happy Dogs, A Mindful Mermaid Story, and Mindful Goslings. Swans gracefully float across wetlands, lakes, ponds, seas. Swans are calm most of the time. 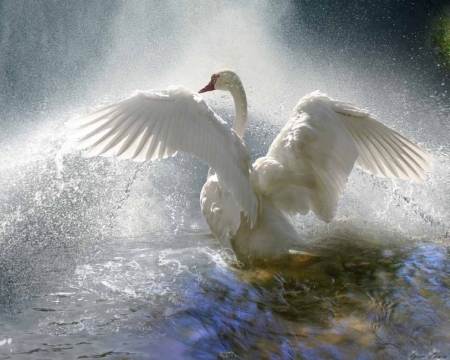 Most swans gracefully fly in hibernation season in search for warm water. Graceful people can float in pools and beaches. People can be calm sometimes. People can walk, swim, play, smile, stand, and sitting gracefully. Living: Live in a place full kindness, courage, loving, conviction, non-resistant and acceptance. Sleep: Knowing that you’re loved, helps you to go to sleep gracefully. Connecting With Emotions: It will make you feel graceful afterward. I hope you enjoyed this week’s edition of Emotions With Animals! Check in next week for another round of Emotions With Animals! If you’re waiting for a emotion story, hang in there! It will be next. Don’t forget to check out Camilla’s blog at Mindful Musings. Beautiful swan landing. I also got this photo from Google Images! This entry was posted in Lillian's Thoughts and tagged 2016, animals, Emotions, graceful, happy, lillian, lillian darnell, Lillian's Thoughts, subscription, Water by lillian. Bookmark the permalink.